NILS ROSTAD has been playing improvised guitar for years (in addition to being a painter). His style is self-taught and can be very intense and private, owing more to American primitives like Dredd Foole, Loren Connors or Christina Carter, than to the European avant-garde and the free jazz. Using both timbre, attack and volume as effects (in addition to effect pedals) his sound comes across as highly personal and sparse. He has also been playing as a duo w/ Sindre Bjerga under the name Magnetic North Duo. A donation for the traveling artists is welcomed! Vatican Analog. Noise, drones, soundscapes, microsound, performance art, ambient – hypnotically soothing, insanely weird, enlightening psychedelic or terribly harsh. Vatican Analog is a label and open and dynamic platform for high quality odd sounds. 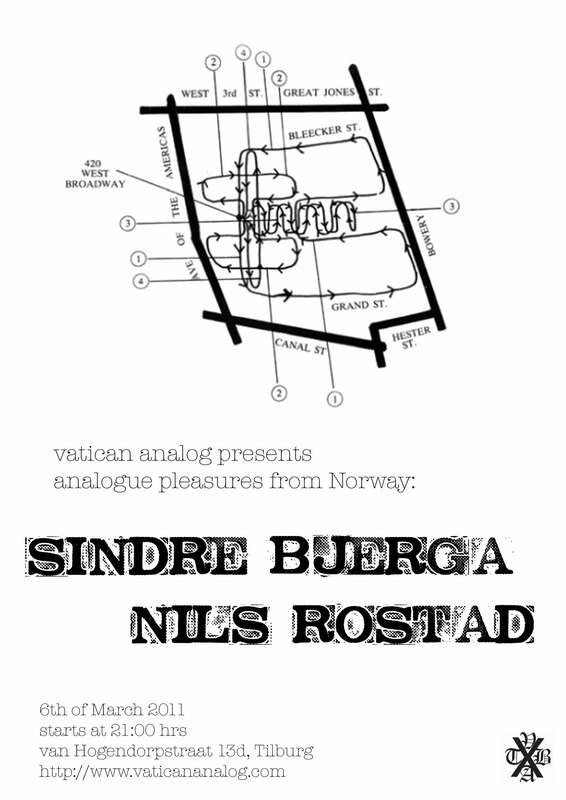 Our ultimate blog on what's new in Vatican Analog and other highlights from the world of experimental music as we like it. Check the full blog here. We release works by artists from, related to and outside of our collective. The music is as freely available as possible via many channels on the internet - physical releases are available to order via our websites. We sometimes setup noise shows and festivals in Tilburg. Vatican Analog artists get on the road so now and then to play gigs around the globe. @ twitter - follow thou me!